The Evolution of Trading: How Technology and Governance Are Changing Finance in the 21st Century uncovers groundbreaking ideas useful for a variety of readers. 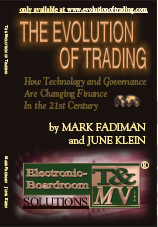 Authors June Klein and Mark Fadiman "wrote the book" on global trading - where we were, where we are and where we are going. 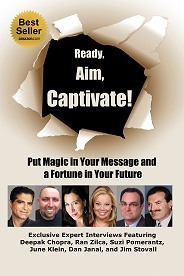 The book begins with quotes from leaders such as Bear Stearns' Vice Chairman, Oxford Internet Institute's Director, former Wall Street Journal editor and former Forbes editor. The two main drivers behind the globalization of finance, regulation and technology, are discussed in depth. The epilogue covers the inevitable next chapter in the global money business -- a centralized marketplace for capital formation. Read The Book if you want to "e-volve" and survive.